The Japanese have done it again - creating a new genre of music that we didn't even know we needed until they invented it: Kawaii Metal or 'cute metal'. Who knew heavy metal was due for a complete overhaul and reconstruction? We certainly didn't - until we heard what the Japanese music industry came up with: Babymetal - 3 teenage girls (Yuimetal, Su-metal and Moametal) with sweet vocals, and snappy dance moves - singing catchy lyrics in Japanese to very loud music with smashing drums, driving beat and the full metal sound. The music may not be your normal cup of tea. but it is weirdly irresistible - and it's all in Japanese racing up the album charts in Australia, the UK and elsewhere. The girls are bilingual of course - while they sing mostly in Japanese, they often talk to their fans outside Japan in English. 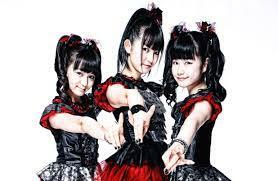 To learn more about Babymetal and to hear their sound, click here.